In July 2019 the Larry Bruno Foundation is sponsoring a celebration to honor community members for their contributions to the local community. Hall of Achievement Reception: The Larry Bruno Foundation will host a private reception for the Hall of Achievement Inductees and Honorees on Friday evening. Food and refreshments will be provided. The reception will be held at 7:00 pm at Ramada by Wyndham (formerly The Park Inn by Radisson) located in Beaver Falls, PA. Invitation only and ticket required. Library and Hall of Achievement Open House: The Carnegie Library of Beaver Falls and The Larry Bruno Foundation will welcome attendees to the Hall of Achievement from 11:00 AM – 1:00 PM. Refreshments will be served. 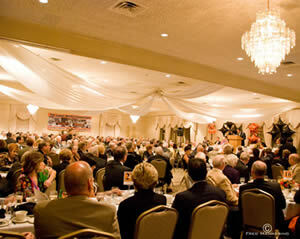 Celebration of Honorees Dinner: The Larry Bruno Foundation is hosting a celebration and gathering from 5:00 – 8:30 PM at the Shadow Lakes Country Club in Aliquippa, PA for friends, family and fans to celebrate the 2019 inductees. Cash Bar and Hors d’oeuvres will be served from 5:00 – 5:45 PM with dinner following from 6:00 – 8:30 PM. A maximum of 350 tickets will be available to attend the celebration. Special Guest and Entertainment with evening activities will also be provided. Ticket required.